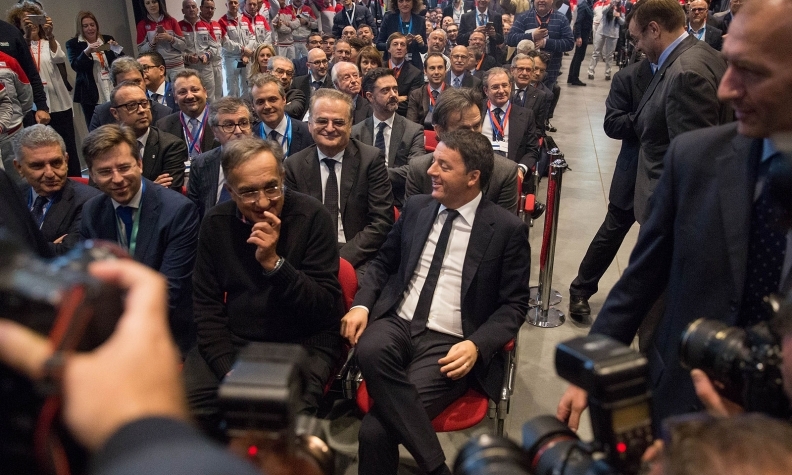 Fiat Chrysler CEO Sergio Marchionne, left center, with Matteo Renzi, Italy's prime minister, right, during an event at the Italian carmaker's Alfa Romeo assembly plant in Cassino, Italy. CASSINO, Italy -- Fiat Chrysler Automobiles CEO Sergio Marchionne warned that Italy could face serious damage to its image if voters rejected constitutional reform in a forthcoming referendum. Prime Minister Matteo Renzi has said he will resign if he loses the Dec. 4 ballot on his proposals to drastically reduce the role of the upper house Senate, saying he has no intention of clinging to power if Italians reject change. Opinion polls show the 'No' vote well ahead and financial markets are growing increasingly nervous, fearing renewed political instability in the eurozone's third-largest economy. Italy's business community has supported Renzi's reform drive, but companies have mostly stayed on the sidelines of the bitter debate, fearing that backing 'Yes' could backfire at a time of growing anti-establishment sentiment across the Western world. But with defeat looking increasingly likely, Marchionne said during a visit to one of his company's Italian factories that it was time to speak out. "Italy is a country that deserves better," he told reporters, saying a "No" vote risked damaging market perceptions and might scare off foreigner investors. "I think it is completely unnecessary for Italy to risk that exposure," he said, adding he was not sure Italy was "elegant enough to withstand the shock." Renzi says his wide-ranging reform will strengthen future governments by curbing the Senate's powers and preventing it from blocking legislation. Opponents say the overhaul would complicate the parliamentary process and undermine democratic checks and balances put in place after World War II. Marchionne said the reform might not be perfect. "But its value lies in its recognition of the willingness of the country to change. It is time to stand behind the prime minister on this," he said. Founded in Italy, Fiat took control of troubled U.S. automaker Chrysler in 2014, and now the joint entity makes around 85 percent of its profits in North America. As such, Marchionne said he was following the moves of U.S. President-elect Donald Trump closely, calling the billionaire' s election "a game changer." Trump has said he plans to renegotiate the North American Free Trade Agreement (NAFTA) to make it "a lot better" for U.S. workers. Marchionne said this was a "big issue" because his firm had interests in the United States, Canada and Mexico. "We will obviously work with the U.S. administration ... We will try to point out what our views are on that issue at the relevant time. The organization is strong enough to adapt to changing conditions. It is certainly swift enough to be able to adjust and respond."